Commemoration of Ibrahim's (Abraham's) willingness to sacrifice his son for Allah. Eid al-Adha (Arabic: عيد الأضحى ‘Īdu l-’Aḍḥā) "Festival of Sacrifice" or "Greater Bairam" is a religious festival celebrated by Muslims all over the world. It is when Muslims sacrifice a goat, sheep, cow or a camel, sending part of the meat to poor people as a donation. It marks the end of the Pilgrimage or Hajj for the millions of Muslims who make the trip to Mecca each year and pray 5 times a day. They like to tell Allah what they are thinking and hope for him to help them, and remember Ibrahim and Ishmael's courage and devotion to God. The festival is to celebrate Ibrahim's (Abraham) willingness to sacrifice his son, Ishmael, because Allah told him to do so in a dream. At the final moment, God told him to sacrifice a lamb instead, and this act of sacrificing a sheep is copied by Muslims all over the world today on Eid. Ibrahim was tempted by Satan not to listen to God, and Ibrahim drove Satan away by throwing pebbles at him. This is also still commemorated by Muslims during Hajj. The Eid prayer must be offered in congregation. 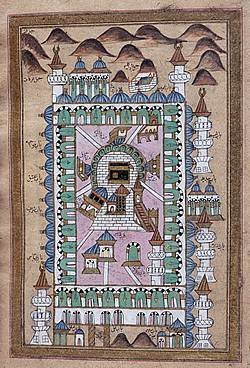 It consists of two Rakaah (units) with seven Takbirs in the first Raka'ah and five Takbirs in the second Raka'ah. The sacrifice of an animal, usually a cow, sheep or a goat, is a very important part of Eid. The act repeats what Ibrahim did, and also shows Muslims' devotion to God (Allah). Muslims celebrate by having a feast, and giving gifts to the poor. In some Muslim traditions gifts are also given to children. In Muslim countries the day is given as a national holiday. Eid al-Adha Facts for Kids. Kiddle Encyclopedia.